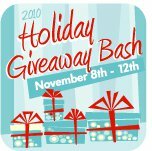 Thanks so much to all who entered the 10 giveaways that I hosted for round 2 of the Win Giveaways 2010 Holiday Bash! Below is a list of winners. All winners have been notified and prizes have been claimed. Thanks so much to all of our wonderful sponsors for making the 2010 Holiday Bash (round 2) a huge success!